While the mainstream press portrays newly reappointed Fed Chairman Ben Bernanke as a mild-mannered hero, the reality is he is responsible for much of the economic pain Americans are feeling. Bernanke sits in front of protesters as he prepares to testify before the House Financial Services Committee on Capitol Hill. The NewsHour With Jim Lehrer can be thought of as the Potemkin village of American democracy. Every evening, it presents a prettified version of political debate–ever so civil and high-minded–that thoroughly blots out the substance of dissenting critics or the untamed opinions of mere citizens. PBS’s sanitized version of news was deployed this summer to assist the charm offensive launched by the Federal Reserve and its embattled chairman, Ben Bernanke. The NewsHour staged a “town meeting” in Kansas City at which Bernanke fielded prescreened questions from preselected citizens. As town meetings go, this was strictly polite. As TV goes, it was deadly dull. The citizens were so deferential they seemed sedated. Jim Lehrer was so laconic, several times I thought he had nodded off. The message, however, was reassuring. With folksy talk, Bernanke came across as a mild-mannered professor earnestly coping with financial complexities and sleepless nights. Gentle Ben struggles to save us from another Great Depression. People are angry at the Fed (and the elected government) for devoting so many trillions to bail out failing bankers while the populace copes with the disastrous results of the bankers’ folly. Bernanke said he too hated the bailouts but had no choice. “I am as disgusted as you are,” Gentle Ben allowed. To show further he is a good guy, Bernanke appointed a labor leader, Denis Hughes, as chairman of the board at the New York Federal Reserve Bank (the operating president, however, is a Goldman Sachs guy). In the real world beyond Brooks’s grasp, this “job well done” counts as cruel joke on the hapless victims. The Federal Reserve did not “avert disaster” for many millions of Americans. It helped to cause their disaster. The central bank, as I have written, was co-author of the destruction, along with the reckless financiers of Wall Street. Now we are told to feel good about its heroic efforts to clean up their mess. The personalized narrative is the standard approach the establishment uses to disarm substantive critics and divert public opinion. Create a fictionalized drama about the wise leaders who manage “to do the right thing” in the face of horrendous adversity and wrongheaded political opposition. Remember Alan Greenspan celebrated as the Maestro. Or Time‘s “Committee to Save the World” cover after the 1998 Asian financial crisis–picturing Robert Rubin, Alan Greenspan and Larry Summers as our saviors. Now it is Gentle Ben to the rescue. The tradition of dramatizing financial titans as public heroes probably started 100 years ago when J.P. Morgan was acclaimed for saving the national economy after the Panic of 1907. That comforting story is still told by adoring pundits who lionize the famous banker as a symbol of market ideology. Only they have the story backwards. The true history is that the federal government–Washington, not Wall Street–came to the rescue of banking in 1907. It was the first bailout for Wall Street. The rescue convinced bankers they needed the Federal Reserve to do more of the same and it has. The media mobilization in behalf of Bernanke created the presumption that President Obama would be foolish not to reappoint him as chairman for four more years. A supposed “poll” of financial experts, reported by the Wall Street Journal, made it clear that Wall Street wants him. The implicit threat to Obama was that if he chose someone else, the financial markets would tank and the president would be blamed. To avoid the risk, Obama folded early–four months early–and interrupted his vacation to announce Bernanke’s reappointment. The deification is at best premature. Bernanke was right to act aggressively, flooding the streets with money to avoid the full catastrophe of deflation (the grave error the Fed committed after the stock market crash of 1929). He is wrongly criticized for his excess, but Bernanke also hasn’t yet won this struggle. The big boys of Wall Street are revived or on government life support, but regional and smaller banks are still failing at an alarming rate. Prices, wages and production are still falling in various markets around the world. If financial markets break again in coming months, Bernanke may be nominated as goat, not hero. The damaging error that Bernanke–and Treasury Secretary Timothy Geithner–have committed is to hand out all that money without demanding anything in return from the bankers and financiers. This is downright un-American, if you think about it. If the government provides subsidies to private enterprise, it has the right to expect different behavior from the recipients. Bankers were bailed out and given numerous guarantees, yet they still aren’t lending. Bernanke, after all, is a very conservative financial economist–vetted for chairman by the Bush White House and ex-hero Greenspan. Bernanke has long espoused a narrow, even right-wing doctrine that the Fed’s role should be to focus primarily on fighting inflation, not improving conditions in the real economy. When and if recovery does develop, he will be under intense pressure from financial interests to put on the brakes and head off any threat of inflation. The chorus of “hard money” advocates is already singing that siren song: raise interest rates before the economy gets too healthy. 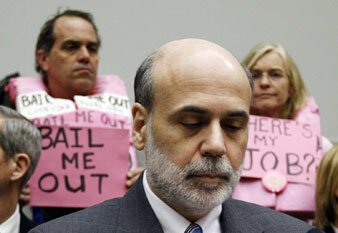 If Bernanke follows through on their demands, the president may come to regret his choice. While the big media led cheers for Bernanke’s reappointment, I was out in Decatur, Illinois, with a group of ordinary citizens who confronted the Fed for its failure to address the real pain and loss people are suffering. The Central Illinois Organizing Project brought together 500 people on a Saturday morning to deliver their own demands to the three Fed officials in attendance (Bernanke was invited but did not show). Among the propositions was a brilliant challenge to the central bank: the Fed should use its awesome influence (and maybe some of its money) to organize an investment consortium of banks to finance some real-life development projects in Peoria and Pekin. This could be a pilot project that demonstrates how this venerable institution can reform itself by serving the broader public interest. The grassroots plans, properly grounded in analysis, were impressive– common-sense ideas for improving lives and communities. If the Federal Reserve urged bankers to do the lending, the bankers would surely listen. Will Bernanke consider this or other such ideas? Don’t hold your breath. That is what’s fundamentally wrong with Bernanke and the Fed. They don’t serve this public. They don’t even see it.